I have always enjoyed talk radio, and in a “go, go, go” society, we have no time to sit down and read the newspaper. It makes it much easier to be able to enjoy your news while driving or wherever accessible. However, accessibility was one of the major criticisms with talk radio, the inability to listen to your favorite stations without having a radio became problematic. This want to be able to listen to radio on demand brought to fruition “web radio.” Now with the internet being so accessible web radio became a hit, which lead to the ultimate creation of podcasting. Podcasting brings a sense of “uncanny” as Gunning describes, because it evokes a feeling of reminiscence while combining an air of newness. The gathering of a family around a radio is an iconic picture of American culture, albeit a bit dated. That is why I believe the excitement and entertainment that came from listening to the radio has been broken down to a more personalized, unpredictable and concentrated format. Gunning goes on to talk about this want for technology to be able to turn the future into a Utopia. The idea is that while technology advances more of our wants are met. In this instance, my generation aptly named the “Me Generation” wants everything personalized. With podcasts we don’t have to “suffer” through listening to commercials, or only being able to listen to a particular show at a particular time. The want for a more personalized, a more portable entertainment has been met. Ciccarelli, Stephanie. 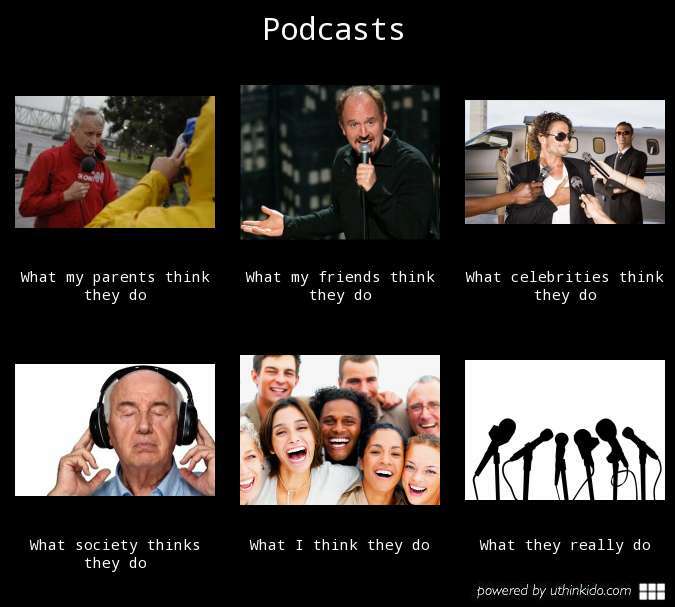 “History of Podcasting.” Voices.com. Voices, 01 Aug. 2013. Web. 29 Jan. 2014.